Lincoln describes its 2017 MKZ as “quiet luxury”; however the new model has a potent engine that produces a siren song-with an impressive 400 horsepower and 400 lb.-ft. of torque. Currently Lincoln’s best-selling vehicle in North America, the midsized luxury sedan gets a significant mid-cycle refresh for the 2017 model year that zeroed in on updated quality, performance and style. Revealed at the 2015 Los Angeles Auto Show, the 2017 Lincoln MKZ will be the first vehicle in Lincoln’s lineup to adopt the company’s new design language previewed earlier on the Continental concept car, although it shares some similarities with its crossover stablemate, the MKC. It goes on sale in the summer of 2016. Competitors include the Cadillac CTS and the BMW 3-Series. Featuring Lincoln’s signature one-piece trapezoidal, meshed front grille; jewel-like, slim LED headlights and taillights; an updated interior with a floating center console; additional safety features (including available automatic braking collision avoidance with pedestrian detection); and a more nimble ride with new engine choices, the premium sedan promises to continue in its role as a flagship model for the brand. The newest model is more understated and classy- a departure from the previous generation’s styling that was more bold and brassy, when it debuted in 2013. It has gorgeous back-end tailoring that gives it fast-back looks from the rear. 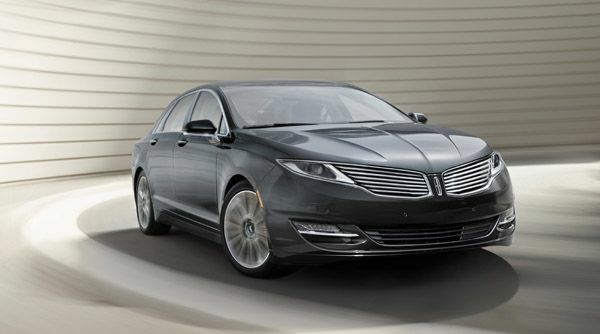 The new 2017 Lincoln MKZ will be powered by a choice of three drivetrains, including a hybrid. At the top of the line is a new unique-to-Lincoln 3.0-liter twin-turbocharged six-cylinder engine that produces 400-horsepower and 400 lb.-ft. of torque, paired with an intelligent all-wheel-drive system (front-wheel-drive 3.0-liter models are limited to 350 horsepower). A 245-horsepower, 2.0-liter GTDI four-cylinder EcoBoost engine is a front-wheel drive model. Both are shifted via a six-speed SelectShift automatic transmission with a push-button selector on the center instrument panel or steering-wheel-mounted paddle shifters. Available Lincoln Drive Control allows drivers to choose between three drive modes – comfort, normal and sport. The system includes continuously controlled damping, and electric power-assisted steering to provide comfortable, confident handling, says Lincoln. The MKZ Hybrid is powered by a 2.0-liter four-cylinder hybrid drivetrain with lithium-ion batteries and a continuously variable transmission; it has better packaging and lower weight than previous Ford-produced hybrids. A Driver’s Package will bring Dynamic Torque Vectoring that will aid with cornering. The Driver’s Package also trims the interior with multi-contour seats, carbon fiber appliques, and aluminum pedal covers and adds 19-inch wheels, Ebony-painted calipers, and a Magnetic grille hue on the exterior. Available enhanced park assist uses ultrasonic sensors to enable the MKZ to steer itself into either a parallel or perpendicular parking spot, and assist with park-out, as needed. Available adaptive cruise control with stop-and-go functionality can automatically slow the car, resuming higher speeds when traffic clears. The system activates the brakes automatically to bring the car to a complete stop if the driver fails to apply brakes in time. An auto hold feature keeps the vehicle at a complete stop without the driver having to press and hold the brake pedal – promising a more relaxing drive for MKZ owners, even in stop-and-go driving. Inside, Lincoln says its engineers paid particular attention to the sound and feel of new switches and dials that replace slider adjustments for easier control of ventilation and audio functions. Commonly used buttons and USB ports are now even easier to access. An active noise control system contributes to a quiet cabin. A fully retractable panoramic glass roof is available, as well as a Revel audio system by Harmon that offers concert-quality sound, thanks to new doors specially designed for optimal positioning of the speakers. The new MKZ will also boast the latest version of Sync connectivity with a new easy-to-use design, a new interface, and voice-activated control. The new sedan will be available with two all-new Lincoln Black Label themes, Chalet and Vineyard, as well as the previously available Thoroughbred trim level; each will offer unique luxury styling and premium materials. The 2017 Lincoln MKZ interior color palette includes a collection of beautiful shades such as Cappuccino, Ebony, and Terra Cotta, as well as an all-new Jade Gray hue. Pricing and estimated fuel economy figures are yet to be announced. 2.0-liter four-cylinder hybrid drivetrain with lithium-ion batteries.